Posted April 15th, 2019 by Melody Taylor-Fliege & filed under Coffeeshop Coaching. Join me online via-ZOOM for my next Virtual Coffeeshop Group Coaching! It’s free! I will be coaching you live from Beijing, China! No need to sign up! To join the online ZOOM Coffeeshop Group Coaching, just click the link below at the appropriate date/time-zone! 30-min. Virtual-Zoom Coffeeshop Group Coaching live from Beijing, China on Tuesday, 16 April 20:00 GMT+8hrs (8pm Beijing China Time Zone) Topic: Power in the walls you create! Topic: Power in the walls you create! Let’s discover together the power in the walls you create in your life! While walls are structures meant to protect you from harm, they can also unintentionally block you from desired expansion and growth. A structure can provide stability, support, space, etc. Structures can also limit, block, and crumble. When thinking about the habits and routines and other structure in your life, notice how they serve you. Repetitive behavior creates balance and eventually leads to imbalance. Many times the smallest adjustment can bring significant change. When you think about the structures in your life, what shows up? What other perspective is possible? What do you notice about how the structures in your life serve you? Which values do the structures in your life bring up? What might they be telling you? How can you restructure one of your routines to help you push past an obstacle in your path of achievement? Be prepared to share something you discover from the questions above and ask more questions to the group via chat during the ZOOM-Coffeeshop Coaching. Open your mind and together let’s uncover new perspectives and valuable takeaway tools for your life! NOTE: If the link above does not work, go to my Free Group Coffeeshop Coaching page on my webpage and at the appropriate time/date click on the ZOOM link found under “Next Free Virtual Group Coaching” list to join. Virtual Coffeeshop coaching is confidential while using a more relaxed and informal platform that being part of an online coaching group can provide. An added twist of value that Melody brings to the online coffeeshop is the power of perspective. Perspectives are valuable in the coaching process for clarity, opening up and leaning into what’s new in any change process. 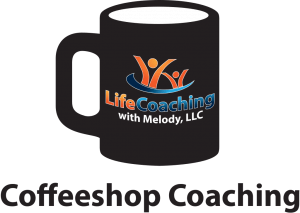 Melody utilizes the energy of her live location in the world at the time of each Virtual Coffeeshop Coaching to help harvest new perspective value and takeaway tools for individual attendees. We meet online via ZOOM over a cup of coffee, tea, or whatever is appropriate for your time zone. Although this isn’t corporate coaching, don’t be fooled into believing that the depth and amount of change to be achieved is any less. This style of coaching is just as committed as any other form of coaching just experienced in a more gentle and relaxed way of coaching support, encouragement and none-judgmental accountability.These group coachings usually last 30 minutes, and they are FREE! For my worldwide regulars just click on the ZOOM link on my Free Coffeeshop Coaching webpage at the appropriate date/time-zone and topic you desire from the list! If you are struggling with big changes in your life, need to make a decision, or just need to be heard, coffeeshop coaching virtual or in-person can be the perfect platform for you.